Hello, friends! Summer is in full swing here and with all of this heat I seem to be spending a little less time in my craft room. I am working on a bunch of projects and the to-do list just never seems to end so I’ve made it a habit to spend a couple of minutes every day in my little craft corner to create what my hearts wants. These past couple of days my heart wanted to play with watercolor pencils. I recently bought a case of Derwent watercolor pencils and I was swatching them (I’ll be sharing projects using those in a few days) I remembered about my Faber-Castell Aquarelle pencils and decided to play with those. I had a few sets of Faber-Castel ones and last Fall I got a set of greens and I just never actually to try those, so I was happy to sit down, finally swatch my Faber-Castells and just enjoy the creative process. I used Simon’s Sketch Ranunculus stamp set and a fabulous technique of overlapping white heat embossed images (I shared a bit about that HERE) and colored these using various shades of pink, yellow and coral. I also added a bit of blue and green to the mix. 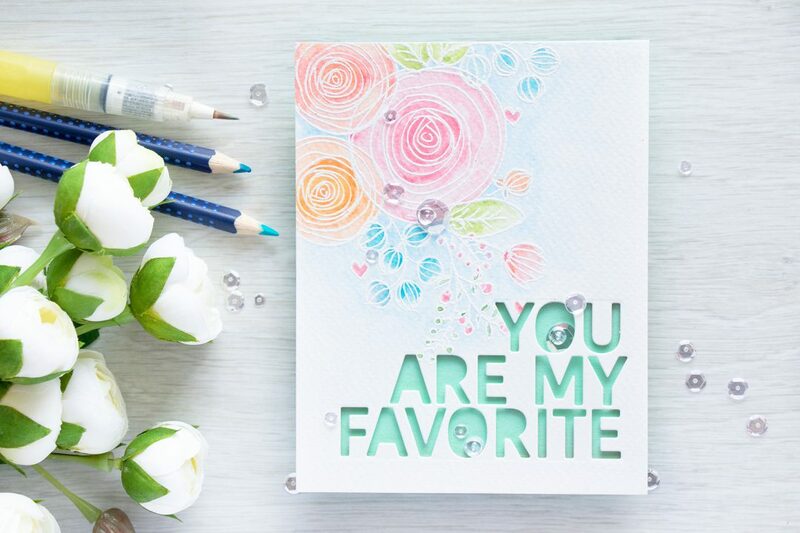 For my sentiment, I used You Are My Favorite die from Simon, its such a fun one, perfect for negative die cutting, I can see myself making a shaker behind those words. 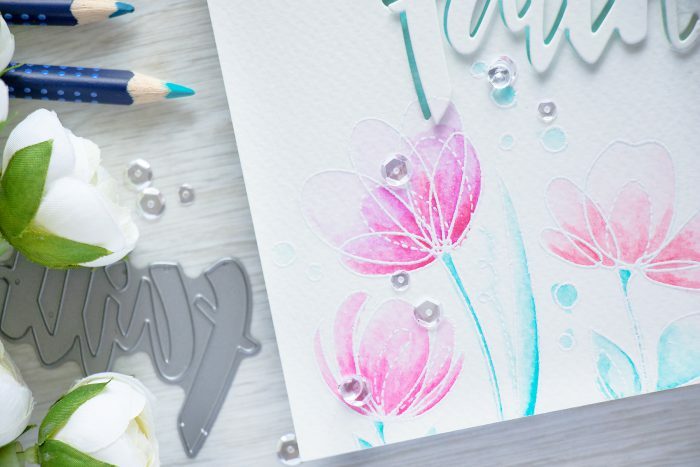 Of course I couldn’t skip my Pretty Pink Posh clear sequins and drops – I added those here and there to complete this card. 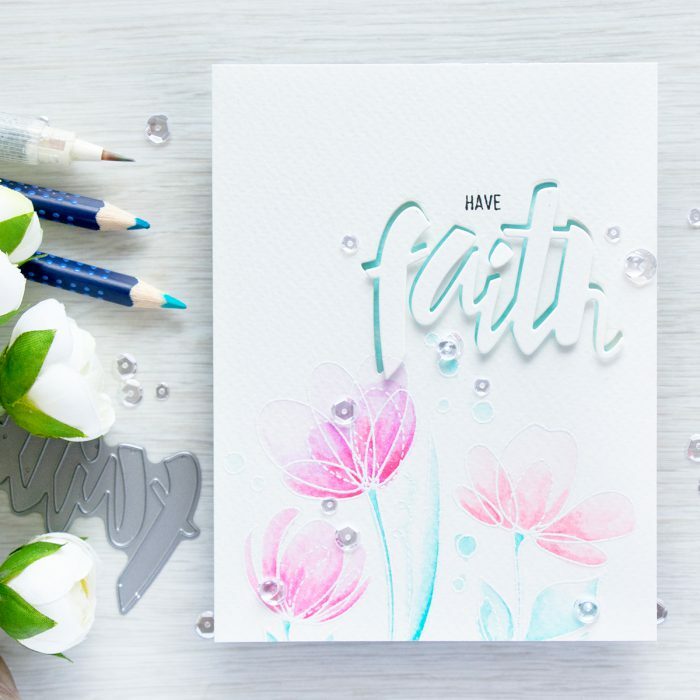 I also made another project using similar supplies, I used Simon’s Spring Flowers stamps and Faith die cut. This card ended up being too simple, looking at the photo I wish I’d added some sort of stitching around the edges, maybe using a Stitched Rectangle die or similar. 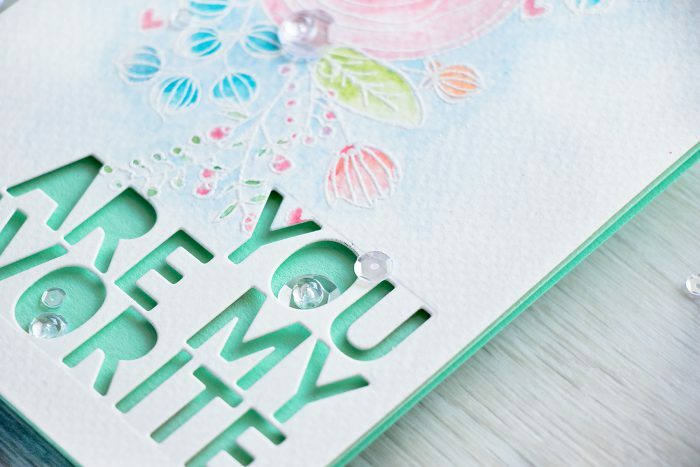 The Faith die cut was popped up and offset to reveal a teal background. I couldn’t find cardstock that would match the colors of the teal pencils I used to color the stems so I just watercolored a piece of watercolor paper with a teal pencil to match. I also wanted to mention Simon’s newest release – Among the Stars! Fabulous goodies, just like always! I am most excited about the Tropical Leaves, I think its such a fun set, ideal for Summer! I can wait for my package to arrive (post has been very slow here lately), hopefully it wont be too long. I cannot handle this softness and gentleness! Breathtaking cards! WOW Yana, these are amazing, so pretty! So pretty Yana! I love the soft colors, and matching paper, great tip. Pencils really intimidate me, I need a little more practice using the water brush to soften the harsh lines out. Thanks for sharing and inspiring. So very Pretty, Yana. 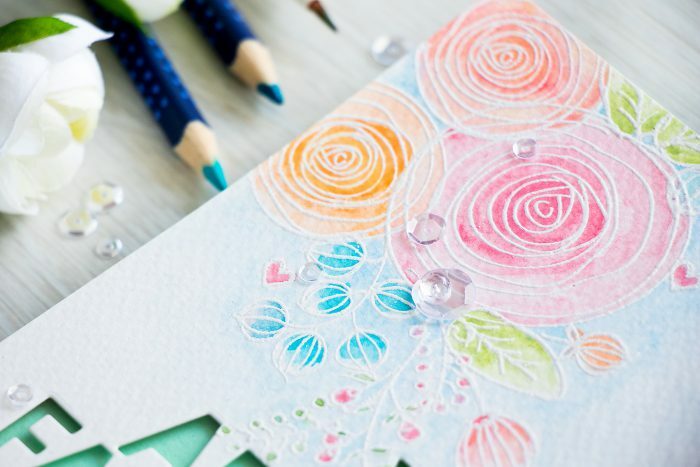 I think I need that Sketch Ranunculus stamp set! 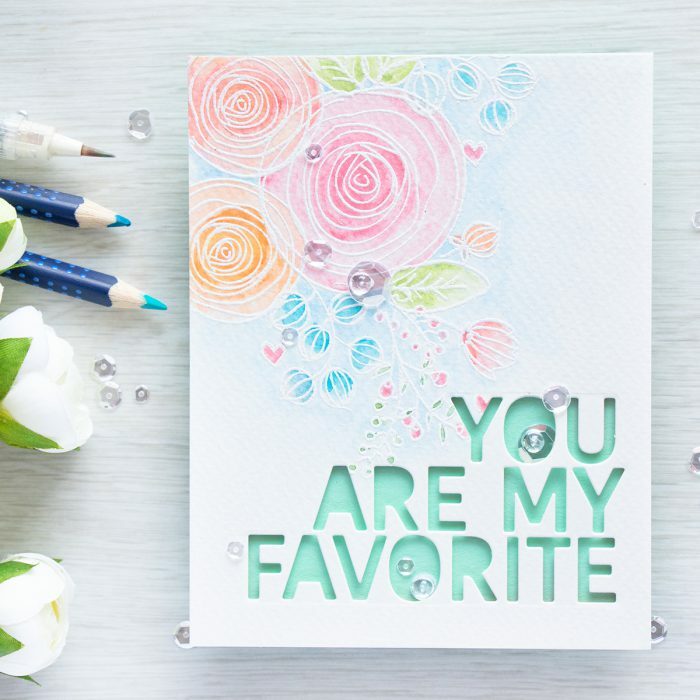 Yana – love your designs and always look forward to your posts.